Preheat oven to 375°F. Line a large baking sheet with parchment paper; set aside. In a large bowl, evenly drizzle your choice of olive oil over cubed bread. Sprinkle the seasoning evenly over the bread & toss gently until well-combined. 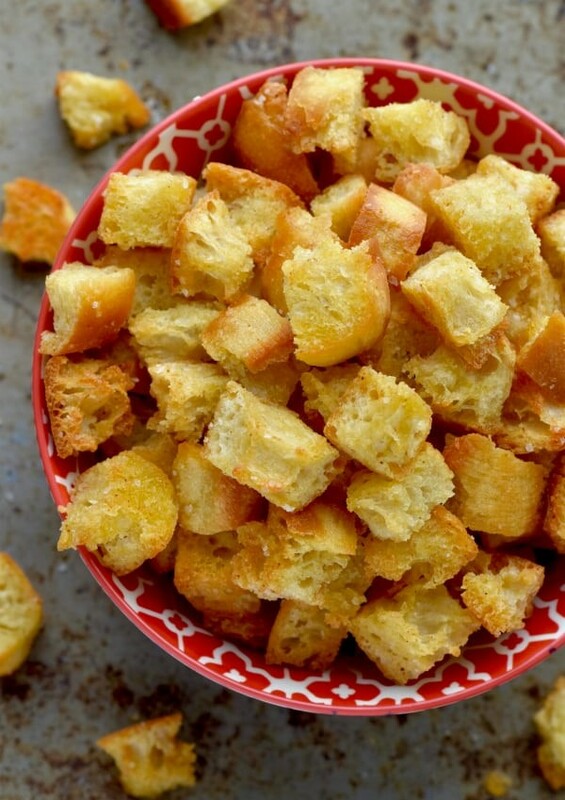 Spread the bread cubes out in a single layer on a baking sheet. Remove from oven, and let cool completely. Use immediately, or store in an air-tight container for up to 1 week. 1. Preheat oven to 375 degrees F. Line a baking sheet with parchment paper. 2. To make the glaze, melt butter in a small saucepan over medium heat. Whisk in flour until lightly browned, about 1 minute. Stir in honey, Sriracha, soy sauce and lime juice. Bring to a boil; simmer until slightly thickened, about 1-2 minutes. 3. In a large bowl, combine wings, butter, Tuscan Herb Olive Oil, garlic powder, salt and pepper, to taste. 4. 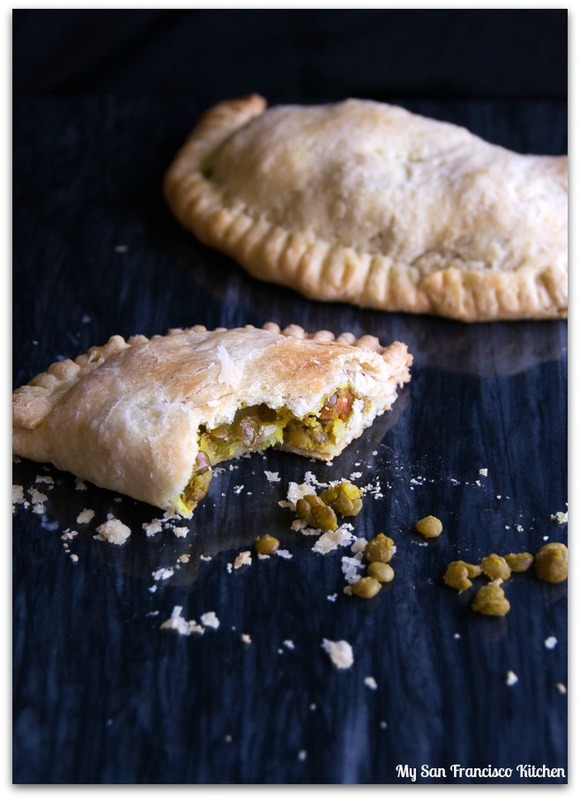 Place onto prepared baking sheet and bake for 25-30 minutes, using metal tongs to turn at halftime. 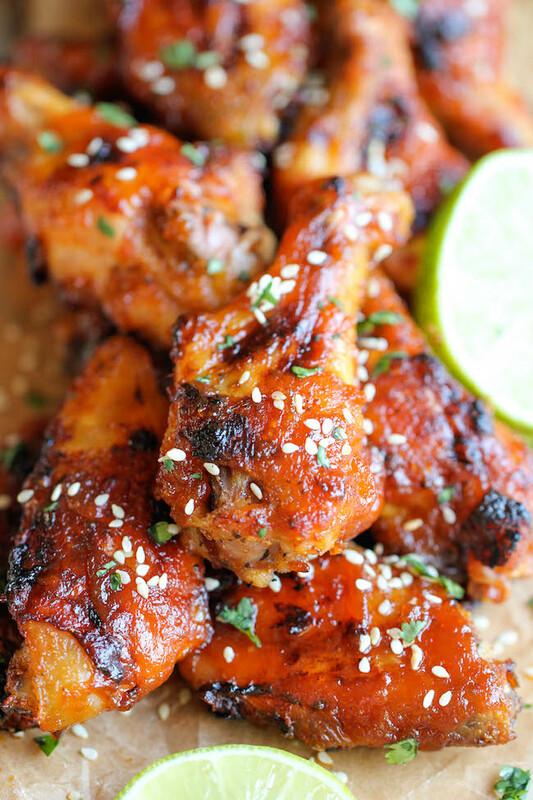 Brush wings with Sriracha glaze and broil for 3-4 minutes, or until crisp and crusted. Serve immediately. Garnish with cilantro and sesame seeds! 1.To make the avocado spread, peel and mash 2 avocados with a fork and mix it with 50 ml of mayonnaise. Season the spread with salt and pepper. 2. At medium to low heat, fry the 4 eggs using Gourmet Blends Roasted Green Onion Olive Oil. Next, fry the 12 slices of bacon until crispy and drain on paper towels. Slice the 2 pieces of tomatoes and toast the 4 slices of English muffins. 3. Spread the avocado mayonnaise in between the toasted muffins. Arrange 2 leaves of lettuce at the bottom along with 2 to 3 slices of tomato. Sprinkle some pepper. 4. Add the fried eggs on top of the tomatoes. Add 3 slices of bacon and arrange evenly. 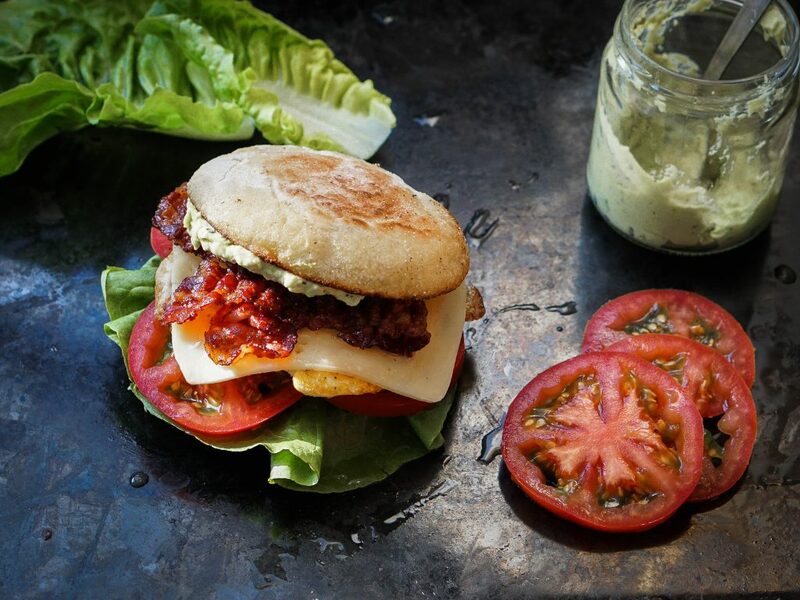 Top it with some more avocado spread before putting another slice of English muffin. This recipe was brought to you by Callum. When he is not creating content online, he’s in the kitchen experimenting with different flavours and food combinations. 1. Preheat the oven to 350 degrees. Line a muffin tin with paper or paper/foil muffin liners. 2. In a large bowl, whisk the eggs, oil, vinegar and brown sugar until sugar is dissolved. Add the applesauce, milk, vanilla, salt, and cinnamon. Whisk until well combined. Stir in the oats and baking powder. 3. 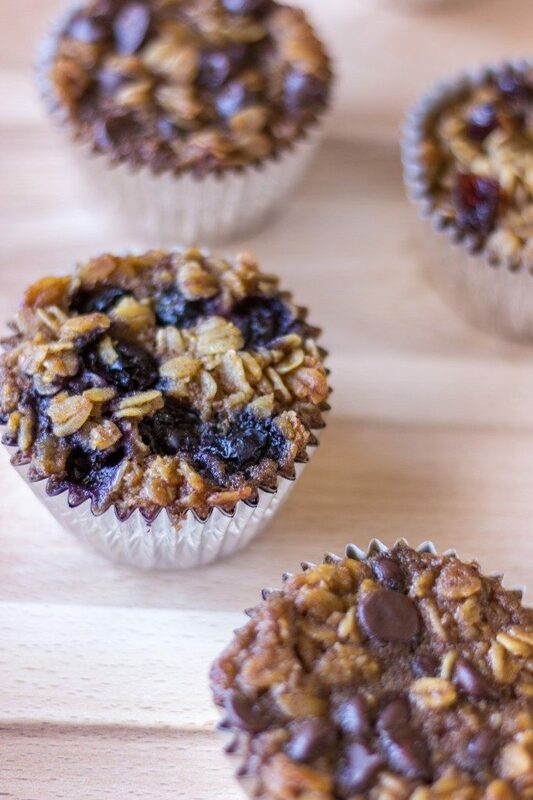 Fill the muffin tin with ¼ cup of the oat mixture in each muffin cup. Add your favorite toppings. Push the toppings down into the oat mixture with a spoon. 4. Bake for 30 minutes. Let them cool for 5 minutes before eating. Store in an airtight container or freeze in a zip top storage bag. 1. First clean and slice up your raw salmon if you are using fresh versus canned. Remove any extra skin. 2. Place in bowl and then add in the your eggs and coconut flour. Mix well. Finally add in your herbs, squash, and seasonings. squash options You can used canned squash to make a fast prep. Or simply cut squash in half, remove seeds, and place in a microwave safe bowl with 2 tbsp water. Cook on high for about 3-4 minutes. Scoop inside and then mash or puree with blender, that’s another option. 3. Mix well into a batter. If batter is too runny, add 1 tbsp more coconut flour. Form into 8 small balls or roll into larger 5-6 balls. Lay them on parchment paper. Press them into patties/cakes so they are around 1 inch thick. 4. Now turn on your skillet to medium high. Add your butter or olive oil. Once heated, add in 3-4 patties/cakes at a time or less. Cook for 3 to 4 minutes on each side or until you see the salmon is cooked thoroughly. If you are using canned salmon, they will cook faster. 5. Remove from skillet. Add more 1 tsp more or so of butter/oil and repeat for the next batch of 3-4 patties/cakes.Garnish with extra rosemary, black pepper, chili flakes, or garlic if desired and serve with your choice of dip/sauce or as is. I used 6 oz fillet (skinned) of sizzlefish coho salmon. Feel free to use canned but it will cook faster, so watch the patties when cooking. 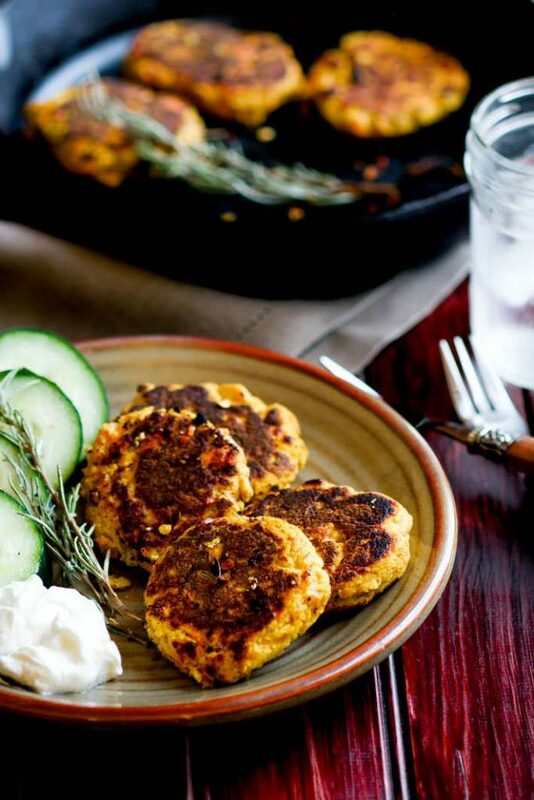 These are freezer friendly and great to make for meal prep or party prep. If you are using Canned, you might need to add an extra egg for binding. 1. Bring a pot of the chicken broth to a boil and add lentils (may choose to soak overnight prior to cooking). 2. Add the curry, turmeric, and pepper. 3. Cook the lentils covered for 1 hour on a low boil (medium heat should be fine, as long as it slightly boils). 4. Add the chopped carrots and potatoes and continue to cook for 20 more minutes. In the meantime, prepare the crust by adding all ingredients to a bowl and using a pastry blender to cut the butter and shortening into the flour until you have a uniform, crumbly mixture. 5. Add the water 1 tbsp at a time and stir with a fork. Add just enough water to gather the dough in a ball with your hands without it falling apart too much, then wrap in plastic wrap and chill in the refrigerator for 1 hour. 6. Roll a fistful of dough out on a floured surface to a circle of about 8 or 9-inches diameter and transfer to a greased baking sheet. 7. Preheat the oven to 425 degrees F.
8. Spoon 1-2 tbsp of filling over one half of the pie, about ½ inch away from the edge. Close the other side over the pie, and wet your finger and use the water to seal the edges. Then, turn the edges over back onto the pie, and seal by pressing a fork all the way around the edge. 9. Bake for 25-30 minutes, until golden brown. 1. Preheat oven to 375 F degrees. Line a baking sheet with parchment paper or a silpat. 2. Beat the 5 eggs in a bowl. Heat the olive oil in a nonstick skillet over medium heat until hot. Pour in the beaten eggs. As the eggs begin to set, gently pull the eggs across the pan using a spatula, forming large soft curds. Continue cooking, pulling, lifting and folding eggs, until thickened and there is no more visible liquid. Remove from heat. 3. Sprinkle the flour onto your work surface then unroll the crescent dough over the flour. Roll it out a bit, if necessary with a rolling pin. Cut the dough into 8 rectangles, by first pinching the seams if necessary. 4. 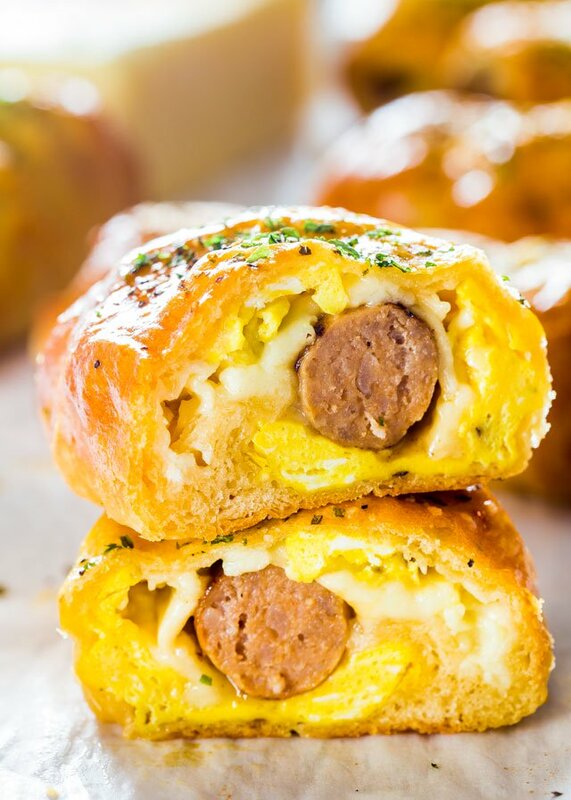 Top each rectangle with a couple spoonfuls of scrambled eggs, some of the cheddar cheese, and a sausage link. Roll up the rectangle and place onto the prepared baking sheet. Repeat with remaining ingredients. 5 Brush each roll with the egg wash, then sprinkle with some salt and pepper. 6. Bake for 15 minutes or until golden brown. Season Chicken with sea salt, juice of 1 lime, fresh black cracked pepper and garlic. Set to side. Pour 1/2 cup Sriracha Mango Balsamic, puréed mango and shallot into bowl and mix until it becomes a thick and chunky dressing. Set to side.Throw chicken on the grill, once it’s done, plate it and slice it. 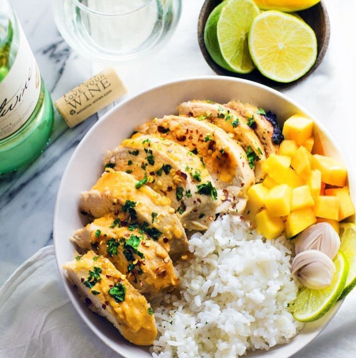 Pour dressing overtop, plate with white jasmine rice and chopped mango, garnish with cilantro and enjoy! MAKE THE PICKLED PEPPER Place the pepper rings in a small heatproof bowl. In a small saucepan, boil the vinegar and salt, stirring, until the salt dissolves; pour over the pepper rings. Let stand at room temperature for 90 minutes. Drain. MEANWHILE, MAKE THE DRESSING In a small bowl, combine the vinegar and shallot and let stand for 30 minutes. Slowly whisk in both oils until incorporated. Season with salt and pepper. MAKE THE SALAD In a food processor, puree 1 ball of burrata until smooth and spreadable. Spread the burrata puree in shallow bowls. In a medium bowl, toss the mint, pea tendrils, purslane and pickled pepper rings with the dressing. Season with salt and pepper and toss to coat. Mound the salad in the bowls. 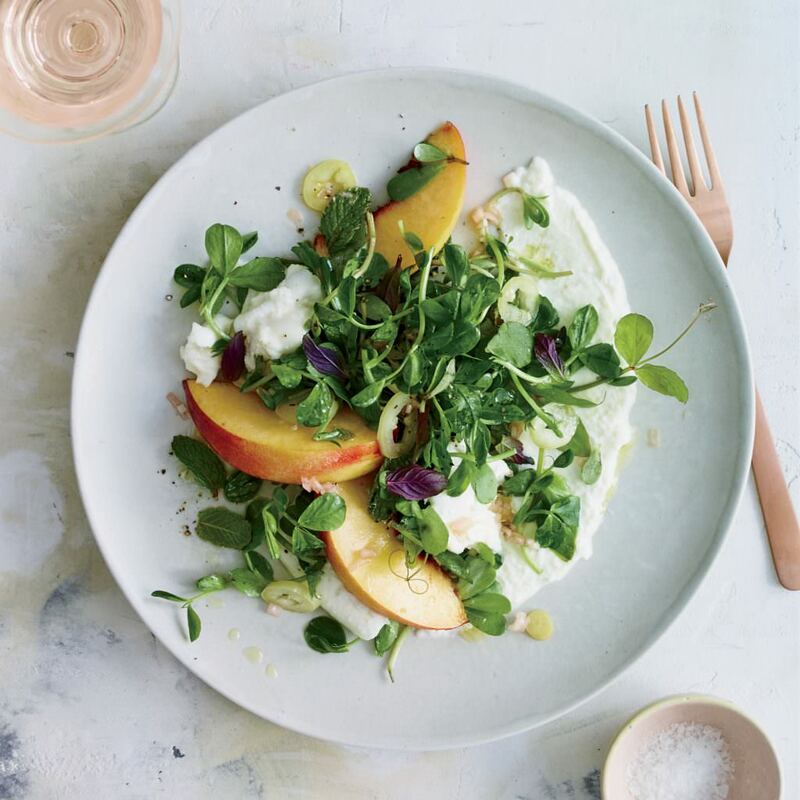 Tear the remaining burrata into small pieces and arrange in the salads along with the peach wedges. The drained pickled pepper rings can be refrigerated for 1 week. Pair this salad with a minerally, strawberry-scented rose. 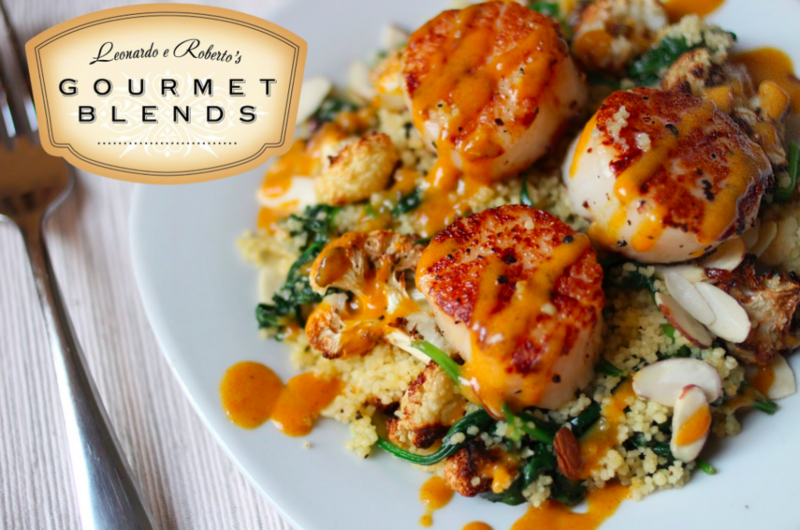 Enjoy our balsamic vinegar and olive oil recipes today!